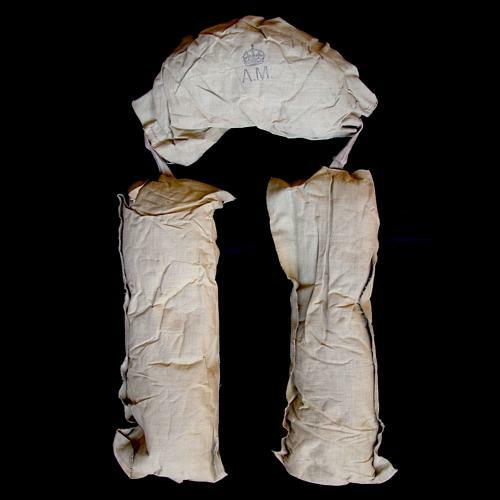 Complete set of three pads linked together with linen webbing tapes. Two rectangular side pads and a kidney shaped neck pad. Constructed using internally rubberised cotton calico 'pockets' stuffed with hand teased Java kapok. The neck pad has a very nice clear Air Ministry and King's crown mark. The pads are creased and lightly soiled but are damage free. Excellent used condition. Used in the extremely rare "Battle of Britain" green Mae Wests and will also fit the yellow and green RCAF versions. Please note that these are not the same as the standard 1941 pattern Mae west pads. Stock code MW23338.